Why Should a Christian Think about Purim? Tonight at sundown, the Jewish holiday Purim begins. I’m not Jewish so I’m not celebrating it, but I think it is worth understanding. Purim commemorates the defeat of Haman, who plotted to eradicate the Jewish people in ancient Persia. 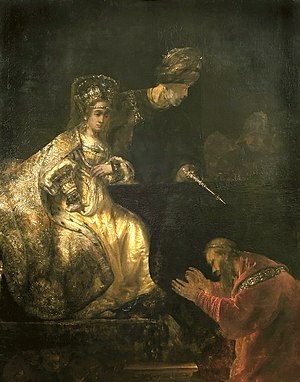 Remember Queen Esther was urged by Mordecai, her uncle, to go to the king to beg for her people’s lives. She and all the Jews in Susa spent three days fasting before she went to the king. She could have been killed for her actions, but wound up being the instrument God used to save the Jews. If you want to learn more about Purim, Jews for Jesus has this fact sheet as well as a very interesting article called A Messianic Look at Purim. This entry was posted in The Word, World Religions and tagged Bible, book of esther, David, Esther, Haman, Jesus, jew, Jewish holiday, jewish holiday purim, jews and gentiles, Jews for Jesus, Mordecai, providence, Purim, queen esther, religion, theology. Bookmark the permalink. 6 Responses to Why Should a Christian Think about Purim? Cool post. I recently wrote about Esther and have since been finding out about Purim. Thanks for the blog! It’s a great celebration of the Sovereignty of God and His plan with Israel that led up to the revelation of Christ as the Savior of all!